Casino Floor, an online casino operated by EveryMatrix Limited, a company based in Malta, strives to deliver the ultimate online as well as mobile casino gaming experience. The online casino operates under a license granted in Curacao. The company behind Casino Floor has its offices at EveryMatrix, Suite 1, Number 62/63, Morina Court, Borg Olivier Street, St. Julians STJ 1081. The games in Casino Floor’s portfolio have been developed by noted software providers such as EveryMatrix, Net Entertainment (NetEnt), and Microgaming. Players can, therefore, rest assured that the gambling experience at Casino Floor is not only entertaining and fun but also safe and secure. The Casino Floor website utilizes a vibrant, exciting and sophisticated layout that has an easy-to-use interface, making navigation incredibly simple. 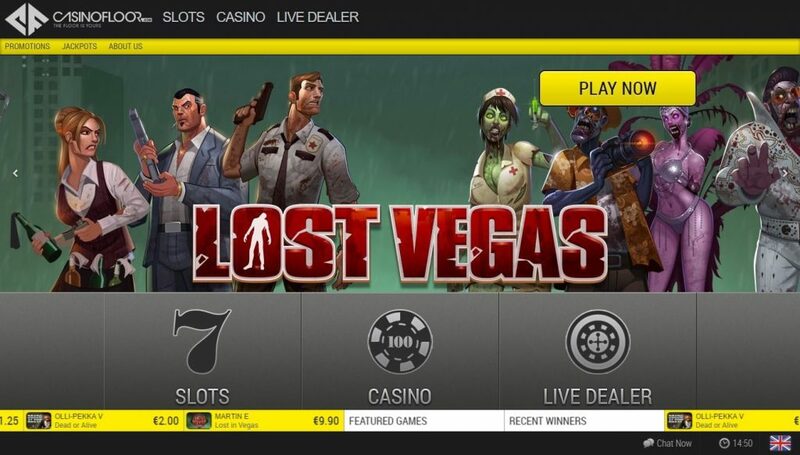 The Casino Floor’s site is decorated in black and yellow colours with all the promotions, game selections and latest news articles in one location. The homepage of the Casino Floor website displays the current welcome package and latest game releases with a simple and elegant slide show that will immediately catch your eye with the bright colours used to present the most recent offerings. The website consists of three main categories, including Slots, Casino and Live Dealer. If you are tired of playing slot games with poor graphics and low resolution, you’ve come to the right place. By selecting the Slots category, you will be transported to the casinos Slot section where you will find an arsenal of slot games that will keep you well entertained during your stay at Casino Floor. You can filter the games by several game types, including Featured Slots, Top 16 Slots, Favorite Games, Video Slots, Classic Slots, Jackpot Slots, Live Casino, Blackjack, Roulette, Baccarat, Texas Hold’em, Table Games, Video Poker Games and Other Games. You will also be able to sort your slot games alphabetically or by their popularity rating. In addition, if you already know what game you’re looking for, you are more than welcome to use the search feature to quickly find your favorite game and get right into the action without having the scroll through pages of slot games to find it. There are over 700 different slot titles at Casino Floor, all with unique bonus features, state-of-the-art graphics, and various pay tables to suit your needs. The Casino category provides everything you will need when it comes to table games. Casino Floor has a massive selection of table games, and the search functionality is the same. You can filter between a wide range of table games and sort them accordingly. The Live Dealer category is an exciting and useful tool to discover the different types of live table games featured at Casino Floor. The live casino section is unreal, and the graphics are of the highest quality. You will get a short introduction to the world of live dealers, and the casino website will provide various game types to ensure everyone can experience the thrill of a land-based casino in the comfort of their own homes. Casino Floor welcomes players with a warm welcome bonus of up to €300, spread over players’ first three deposits. As soon as players sign up and make their first deposits, they will receive a bonus of 100% up to €100 along with 25 free spins on Net Entertainment’s Starburst slot. Players can claim a bonus of 50% up to €100 plus 25 free spins on Dead or Alive slot. The online casino also offers a third deposit bonus of 50% up to €100 plus 50 free games on Starburst slot on players’ third deposits. The online casino also offers a charming birthday bonus to its loyal players—100 free spins that can be used on any slot game. Players do not even have to make a deposit to claim their deposit bonus. In addition, Casino Floor runs lucrative promotions, giving players the opportunity to win free spins, claim reload bonuses, and much more. Slot enthusiasts will have access to any type of game you can imagine at Casino Floor. If you’re looking for the ultimate slot experience, you can choose from the hottest titles such as NetEnt’s Thief and Starburst slot, Betsoft’s Under the Bed and After Night Falls slot, or NexGen Gaming’s The Snake Charmer and Medusa slot. Most of these games are presented with stellar 3D graphics and exciting bonus features, but you can also enjoy a list of classic 3-reel slots as well. There is a full range of table games provided by Betsoft at Casino Floor. These include numerous types of Roulette, Blackjack, and other games like Three Card Poker, Top Card Trumps, Red Dog, Caribbean Poker, and Poker3. The animations are truly smooth, and the game rules are almost identical to land-based casinos. Casino Floor also features 11 video poker variants from Betsoft. These include popular games like Deuces Wild, Jacks or Better, and Tens or Better to the less common games such as Bonus Poker Deluxe, Double Jackpot Poker, and Split Way Royal. Some of these video poker games can even be enjoyed with multiple hands. Casino Floor also presents 7 specialty games including Skratcherz, Predictor, Virtual Racebook 3D and Klub Keno. Casino Floor Mobile has been optimized to be compatible with most tablet and smartphones available on the market. To access the wide range of mobile games, you simply need to load the web-based browser on your mobile device and the mobile-friendly site should load instantly. Casino Floor mobile is supported on several platforms including iOS, Android, iPhone, and iPad. Casino Floor does not mention any awards received or nominations for specific awards on their webpage. Established in 2009, the casino has been involved in the online gaming industry for quite some time, and by utilizing the best software providers in the world, it’s quite surprising that they haven’t been nominated for an award yet. Casino Floor is sadly not available all over the world due to strict regulations in some countries. These restricted countries include; Yemen, United States, U.S Virgin Islands, Turkey, Syria, Spain, South Africa, Singapore, Romania, Puerto Rico, Portugal, Philippines, Pakistan, Northern Mariana Islands, Nigeria, Marshall Islands, Kuwait, Jordan, Italy, Israel, Ireland, Iraq, Iran, India, Hong Kong, Guam, Germany, France, Ethiopia, Estonia, Denmark, Bulgaria, Belgium, American Samoa and Afghanistan. Casino Floor has a Help & FAQ page, which players can access if they want to check out answers to commonly asked questions. Casino Floor offers customer care services daily from 11:00 to 24:00 CET. Players can expect responses to their questions within two hours. To get in touch with the online casino, players can use the online contact form on the casino’s Contact Us page. Customer care at Casino Floor also includes live chat. The Casino Floor software is completely instant-play and available on almost every mobile device. The casino games are powered by some of the leading software providers in the world, including Betsoft, Play n Go, NextGen Gaming, and Net Entertainment. The website layout is extremely easy to understand and makes it even easier to sort through the vast amount of games. The live chat facility is available daily from 13:00pm until midnight, 7 days a week and all information sent to the casino’s servers are protected with the latest SSL encryption technology. The only disadvantages at Casino Floor is the fact that live chat is not available around the clock and there are several countries that will not be able to enjoy the gaming experience at Casino Floor. Casino Floor is definitely worth registering at as it is the winner of the Best NYE Casino Award of 2013, conferred by norskcasino.com. To get started, players just have to register a real play account and fund their accounts using secure banking methods such as credit/debit cards, prepaid cards, and eWallets. The online casino has a presence on social networking sites such as Facebook, Google, Pinterest, and Twitter. The game selection at Casino Floor is simply out of this world and with the unique promotions, new games releases on a monthly basis and the rewards program, Casino Floor can definitely be considered as one of the leading online casinos in the world. If you are tired of playing the same games, from the same software provider, give Casino Floor a go as they utilize a vast range of games from multiple software providers to ensure you are well-entertained.